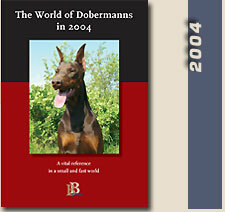 Over the years phenotype and character of the Dobermann has changed. Every period in time had its own ideals. What is the image we aim for now? As breeders we still have a lot of work to do, especially because we have to cope with natural ears and tails. Parallism of the top headline becomes more important than ever. Whilst in the past the rear part of the upper head was hidden by standing ears and kept of the attention of the judges and breeders, natural ears make that part of the head more visible to everyone. The head appears shorter and wider. In judging this has to be taken in account. Judges should learn to look “through” the ears, as they might have to judge cropped and uncropped dogs together in one ring. Unfortunatly until now there are no regulations or standard-descriptions about the desired tail carriepage of the Dobermann. As a breeder I like to see the dog carrying it’s tail high since it looks dynamic and so fits the character of the Dobermann. Nicely carried in a big curve, about a half moon, and not to long, and it has to be in harmony with the body. Although the standard gives no description regarding the tail, the croup definition gives a good description about the onset of the correct tail. “Croup: It shall fall slightly,hardly perceptible from sacrum to the root of the tail, and appears well rounded, being neither straight or noticeable sloping, of good width and well muscled”. This goal will be difficult to reach. A Dutch bloodline which is, sometimes more than once, present in almost every pedigree all around the world, is to blame. This line increased straightness of croup, and thus a high onset of tail. High set tails are carried far over the back and in the worst case even curl. With or without rules, breeders and judges should be spend more attention to this part of the Dobermann. A new phenotype will contribute to a new acceptance of it’s looks, so continuation of the breed will be safeguarded. 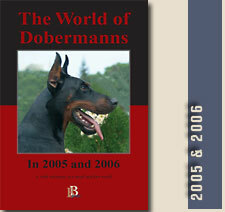 For many of us a Dobermann have become a passion for live. A Dobermann is known for his endurance and integrity. Hundreds of stories a written about his courage and loyalty to his master. Often Dobermann were choosen to be in a movie and occasionally they played the main part in the scene. But unfortunately such a performance produced not only respect of the breed but fear as well. Today the Dobermann’s reputation has become more serious and gentle. Mainly the dog is a beloved member of the family and a guardian of the children. But his courage is there, unchanged. So it is in our hands, Dobermann breeders and lovers, to keep his name high. Conditions for his being that breeders talk honestly to each other and exchange breeding results and failures. If we don’t do that, one day we will be punished for our wrongdoing to the detriment of the breed we say we love so much.